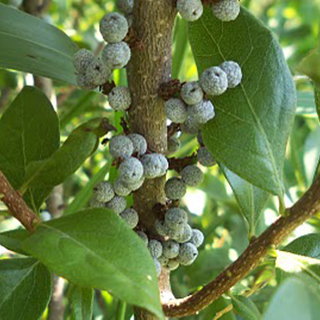 The bayberry plant, also known as Morella Cerifera, Arbre a Cire, Arbol de Cera, Myrica heterophylla, southern Bayberry and Southern Wax Myrt, is a shrub that is more prominently found along the Atlantic coast and Lake Erie. The primary healing factor in bayberry is the fact that contains chemicals that are widely known as tannins which tends to have a drying effect on the skin. The plant itself also gives of a rather aromatic scent when it is rubbed against. The powder is strongly sternutatory and excites coughing; 20-30 grains (1.3-2g). Good as a gargle and injection in chronic inflammation of the throat, leucorrhoea, uterine haemorrhage, etc and is an excellent wash for the gums. Use 1-2 oz (30-60ml). Alcoholic extract, or Myricin, 5 grains (0.3g). Layer in spring, root greenwood cuttings in summer, or sow seed in a cold frame when ripe. Grows in moist, humus-rich, preferably acidic soil in full sun to partial shade. They are tolerant of poor soils, drought, wet soils, and coastal conditions. Harvest the root in late autumn and pound to separate bark from the root. Dry thoroughly and powder. Store in a dark place in tightly sealed containers. Gather the berries early in the morning in the fall or winter and boil to remove the wax. The wax that will float on top is called myrtle wax and can be skimmed off.